1. Wash and chop fresh onion, broccoli, carrots, pepper and parsley (if using fresh parsley). 2. Heat canola oil in a large skillet. Add onions and cook until soft. 3. Add bulgur and stir to coat. Add 2 cups chicken broth to the skillet, bring to a boil. 4. Lower the heat, add remaining vegetables and chickpeas. Cook for 10 minutes or until the liquid is absorbed. Note: Bulgur comes from wheat. It is actually the kernel of wheat, cracked for cooking. 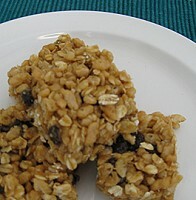 It has a nutty, chewy flavor that is sure to please the healthy appetite, and contains fiber. Canola oil is a healthy choice for vegetable oil. Nutrition Facts per Serving: Calories, 150; Calories from fat, 15; Total fat, 1.5g; Saturated fat, 0g; Trans fat 0g; Cholesterol, 0mg; Sodium, 140mg; Total Carbohydrate, 31g; Fiber, 7g; Protein, 6g; Vitamin A, 50%; Vitamin C, 45%;, Calcium, 4%; Iron, 8%. 1. 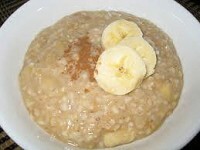 In a microwave safe cereal bowl, mix together the oatmeal and salt. Stir in water. 2. Microwave on high power for 1 minute. Stir. Microwave on high power for another minute. Stir again. 4. Top with banana slices and frozen yogurt. Nutrition Facts: Calories 150; Calories from fat 10; Total fat, 1g; Saturated fat, 0g; Trans fat 0g; Cholesterol, 0mg; Sodium, 290 mg; Total Carbohydrate, 30g; Fiber, 4g; Protein, 7g; Vitamin A, 0%; Vitamin C, 8%; Calcium, 0%; Iron, 0%. Source: Adapted from: Recipe Collection, p.14, University of Nebraska-Lincoln Cooperative Extension, USDA, Snap-ed Connection. 1. In a large skillet, heat oil over medium heat. Add green onions and sauté 5 minutes. 2. Add oregano, basil, black pepper, cayenne pepper, garlic, and tomatoes. 3. Cover and simmer 10 minutes. 4. Add beans; cover and simmer an additional 5 minutes. 5. 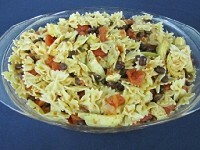 Combine bean mixture, cooked pasta, and artichoke hearts in a large bowl. Mix well. 1. Preheat oven to 425 degrees F. Spray or grease the bottoms of a muffin tin. 2. Put flour in a large bowl. Add salt, baking soda, and sugar. Mix well. 3. Stir in the bran flake cereal. Mix well. 4. Make a well in the center of the mixture and set aside. 5. In another bowl, beat the egg, buttermilk, and oil together. 6. Pour the egg mixture into the well of the cereal mixture and stir until all ingredients are moist. Do not over mix. 7. Fill the tins 2/3 full. 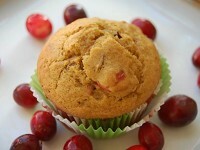 If not eaten right away, wrap the baked muffins in foil or a plastic bag and store in the freezer. Thaw for 15 seconds in the microwave or overnight in the refrigerator. Nutrition Facts per Serving: Calories, 130 ; Calories from fat, 30; Total fat, 3.5g; Saturated fat, .5g; Trans fat 0g; Cholesterol, 15mg; Sodium, 120mg; Total Carbohydrate, 23g; Fiber, 2g; Protein, 4g%. 1. Put the rice cereal, oatmeal, and raisins in a bowl and stir together. 2. In a small saucepan mix together the brown sugar and corn syrup. Turn the heat to medium-high. Stir constantly while the mixture is brought to a boil. Once boiling, remove the saucepan from the heat. 3. Stir the peanut butter and vanilla into the sugar mixture in the saucepan. Blend until smooth. 4. Pour the peanut butter mixture over the cereals and raisins in the large bowl. Mix well. 5. Press the mixture into an 8" x 8" baking pan. 6. When cool, cut into 16 bars. Nutrition Facts: Calories, 200; Calories from fat, 45; Total fat, 5g; Saturated fat, 1g; Trans fat 0g; Cholesterol, 0mg; Sodium, 85mg; Total Carbohydrate, 34g; Fiber, 2g; Sugar, 15g; Protein, 5 g; Vit. A, 4%; Vit. C, 4%; Calcium, 2%; Iron, 10%. Notes: To avoid peanuts or peanut butter, try sunflower seeds or sunflower seed butter. 1. Heat oil in large skillet over medium heat. Sprinkle chicken pieces with seasonings. Add chicken pieces; cover and cook about 10 minutes, stirring frequently until chicken is done. 2. Add onion and stir-fry for about 1 minute. Stir in broth, water, rice, tomatoes, and spinach. Bring to a boil. Reduce heat to low and cover. Simmer about 10 minutes. 3. 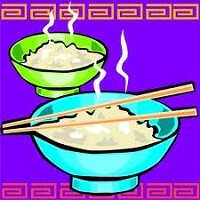 Turn burner off and let stand for 5 more minutes or until rice absorbs most of the liquid. 1. Cook macaroni according to directions. (Do not add salt to the cooking water.) Drain and set aside. 2. Spray a casserole dish with non-stick cooking oil spray. Preheat oven to 350° F.
3. Lightly spray saucepan with non-stick cooking oil spray. 4. Add onions to saucepan and sauté for about 3 minutes. 5. 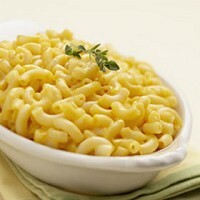 In another bowl, combine macaroni, onions, and the remaining ingredients and mix thoroughly. 6. Transfer mixture into casserole dish. 7. Bake for 25 minutes or until bubbly. Let stand for 10 minutes before serving. Nutrition Facts: Calories: 200, Total fat: 4 g, Saturated fat: 2 g, Cholesterol: 34 mg, Sodium: 120 mg, Fiber: 1 g, Protein: 11 g, Carbohydrate: 29 g, Potassium: 119 mg. Nutrition Facts: Calories, 200; Calories from fat, 60; Total fat, 7g; Saturated fat, 1g; Trans fat 0g; Cholesterol, 30mg; Sodium, 230mg; Total Carbohydrate, 32g; Fiber, 2g; Protein, 3 g; Vit. A, 50%; Vit. C, 4%; Calcium, 8%; Iron, 8%. 1. Brown ground beef. Drain and return to skillet. 2. Stir in spaghetti sauce and Italian seasoning. Bring to a boil. 3. Add 1 cup water and uncooked pasta. Cover and cook on medium heat for 15 minutes. 4. Stir in cottage cheese. Cover and cook for 5 minutes. 5. Stir in 2 cups of mozzarella cheese. Sprinkle the remaining cheese on top. 6. Cover and remove from heat. Let stand for 5 minutes to melt cheese. 1. Put eggs into pan and scramble. 2. 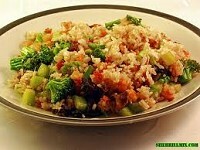 Put vegetable mix and rice back in the pan. Mix with scrambled eggs. 3. Add chicken and cook until hot. 4. Refrigerate Heat oil in a large skillet over medium heat. 5. Add rice and stir for 5 minutes. 6. Stir in carrot, bell pepper, onion, broccoli, soy sauce, black pepper, and garlic powder. Cook until vegetables are tender. 7. Remove mixture from pan. Be Creative! Substitute any fresh, frozen or canned vegetables you like or use leftover vegetables. Nutrition Facts per Serving: Calories, 230; Calories from fat, 70; Total fat, 8g; Saturated fat, 1.5g; Trans fat 0g; Cholesterol, 85mg; Sodium, 610mg; Total Carbohydrate, 28g; Fiber, 3g; Protein, 12g. 1. 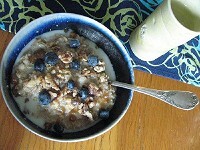 Combine bran cereal and milk in a bowl. 2. Let stand 5 minutes. 3. Stir in egg and oil. 4. In another bowl, combine flour, sugar, baking soda, baking powder, and cinnamon. 5. Add bran mixture to the flour mixture and stir just until moistened. 7. Fill muffin tins that are greased or lined with paper baking cups two-thirds full. 8. Bake at 400° F for about 20 minutes or until done. 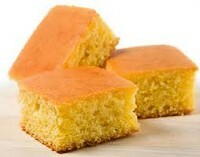 2, Mix together cornmeal, flour, sugar, and baking powder. 4. Slowly add buttermilk and egg mixture to dry ingredients..
6. 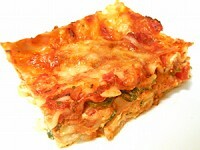 Bake for 20–25 minutes in an 8 x 8-inch, greased baking dish. Cool. Cut into 10 squares. Nutrition Facts: Calories ,178; Total Fat, 6 g; Saturated Fat 1 g Cholesterol 22 mg Sodium 94 mg Total Fiber 1 g Protein 4 g Carbohydrates 27 g Potassium 132 mg. Source: Heart-Healthy Home Cooking: African American Style from the National Heart, Lung and Blood Institute. 4. Use within a month's time because the flax seed can become rancid if kept too long. 1. Wash and chop tomato, parsley, scallion, and carrot. Chop walnuts if desired. 2. Bring water to a boil and add couscous. Stir quickly. 3. Cover, remove from stove, and let stand for 5 minutes. 4. In a large bowl, combine lemon juice, oil, and pepper to make dressing. 5. Add couscous mixture to dressing and stir gently to blend. 6. Add chopped tomato, parsley, scallions, carrot, walnuts (if desired), kidney beans, cheddar cheese, and peas. Mix gently. 7. Serve immediately or refrigerate until ready to serve. May be served warm or cold. Tip: Try whole-grain couscous for extra fiber. 1. 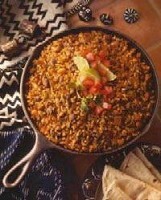 In large skillet over medium-high heat, cook meat until brown, stirring to crumble; drain. Return meat to skillet. 2. Add onion, chili powder, cumin and salt; cook until onion is tender. 3. Stir in rice, beans and chilies; thoroughly heat. 4. Top with tomato and garnish with cilantro if desired. Serve immediately. Notes: If desired, lower the sodium further by cutting back or omitting the salt, especially if your beans are canned with salt. Nutrition Facts per serving: Calories, 313; Total Fat, 9g; Cholesterol, 29 mg; Sodium, 340 mg; Total Carbohydrate, 43 g; Dietary Fiber, 6 g; Protein, 17 g.
2. Coat muffin tin with non-stick cooking spray. 3. Mix egg, milk, sugar, oil, carrots, raisins, walnuts, and vanilla. 4. Mix flour, oatmeal, cinnamon, baking powder, baking soda, and salt. 5. Add wet ingredients to dry ingredients and stir gently until flour is just moistened. Gently fill muffin cups about 3/4 full. 6. Bake for 15 minutes or until edges start to brown. Tips: Try grated zucchini instead of carrots. Morning Muffins freeze well, and thaw quickly. Nutrition Facts: Calories, 170; Calories from fat, 60; Total fat, 6g; Saturated fat, 1g; Trans fat 0g; Cholesterol, 15mg; Sodium, 200mg; Total Carbohydrate, 26g; Fiber, 1g; Protein, 4g; Vitamin A, 15%; Vitamin C, 0%; Calcium, 6%; Iron, 6%. 1. Bring water and stock to a boil in medium-size saucepan. 2. Add rice and stir. Cover and simmer 20 minutes. 3. Remove pan from heat. Let stand, covered, 5 minutes or until all liquid is absorbed. Reserve. 4. Heat oil in large non-stick skillet. 5. Sauté onion and celery over moderate heat 3 minutes. Stir in remaining ingredients including reserved cooked rice. Fluff with fork before serving. Nutrition Facts: Calories: 139; Total fat: 5 g; Saturated fat: less than 1 g; Cholesterol: 0 g; Sodium: 86 mg; Fiber: 1 g; Protein: 3 g; Carbohydrate: 21 g; Potassium: 124 mg.
2. Heat oil in large sauté pan or skillet. Add garlic and cook on low until soft. 3. Add spinach, tomatoes with juice, drained beans, salt and pepper. When the mixture bubbles, cook gently, uncovered for 5 minutes. 4. Add pasta and parmesan to spinach mixture. Toss well and serve. 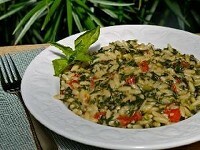 Tips: Substitute cleaned and chopped fresh spinach (about 6 cups). Try other greens, such as Swiss chard or kale. Be sure to clean greens well, and cook until soft. Nutrition Facts: Calories, 290; Calories from fat, 100; Total fat, 12g; Saturated fat, 2g; Trans fat 0g; Cholesterol, 5mg; Sodium, 460mg; Total Carbohydrate, 39g; Fiber, 4g; Protein, 11g; Vitamin A, 110%; Vitamin C, 40%; Calcium, 15%; Iron, 15%. 1. Boil a pot of water and cook the pasta for 8 to 10 minutes; drain when finished and let cool to room temperature. 2. In a separate cup, stir the "wet" ingredients (soup, pumpkin puree, milk, and mustard), and heat in microwave for 45-60 seconds; stir again until creamy. 3. Use a spoon to pour hot cream mixture over pasta and sprinkle cheese on top. 4. Stir pasta, cream mixture, and cheese until cheese melts into the pasta. Nutrition Facts: Calories, 220; Calories from fat, 25; Total fat, 3g; Saturated fat, 1g; Trans fat 0g; Cholesterol, 5mg; Sodium, 230mg; Total Carbohydrate, 38g; Fiber, 3g; Protein, 10g; Vit. A, 100%; Vit. C, 2%; Calcium, 8%; Iron, 10%. 1. Combine eggs, pumpkin, milk and oil in large mixing bowl. 2. Add flour, brown sugar, baking powder, pumpkin pie spice, and salt to egg mixture. Stir gently. 3. Lightly coat a griddle or skillet with cooking spray and heat on medium. 4. Using a 1/4 cup measure, pour batter on hot griddle. 5. Cook until bubbles begin to burst, then cook until golden brown. Tips: No pumpkin pie spice? Use 1/2 teaspoon cinnamon and 1/2 teaspoon dry ginger. Add a pinch of cloves or nutmeg. Put a face on the jack-o-lantern, using raisins for eyes and teeth (drop in batter on griddle while it cooks). Nutrition Facts: Calories, 180; Calories from fat, 40; Total fat, 5g; Saturated fat, 1g; Trans fat 0g; Cholesterol, 30mg; Sodium, 480mg; Total Carbohydrate, 30g; Fiber, 1g; Protein, 6g; Vitamin A, 45%; Vitamin C, 0%; Calcium, 15%; Iron, 8%. 2. Prepare the lasagna noodles according to package directions. Don’t overcook them as they will cook more during the baking process. To keep them from sticking together while you’re getting the other ingredients ready, rinse them under cold water and lay on a cookie sheet, with layers separated by plastic wrap or foil. 3. As you’re preparing the noodles, start assembling the other ingredients. Begin by heating olive oil over a medium-low heat in a large skillet. Add spinach to the pan in stages; turn leaves until they wilt. Add more spinach; repeat process until all of the spinach is added. Remove spinach from skillet, place in a bowl, and set aside to cool. 4. Blend eggs and ricotta cheese in a food processor or blender until smooth. Transfer to another bowl and stir in 2 cups of the shredded cheese. Then, mix in the spinach. Layer 1: 1 cup of the spaghetti sauce, 3 lasagna noodles, and half the ricotta mixture. Layer 3: Top with remaining 3 noodles, spaghetti sauce and the remaining 1 cup shredded cheese. 6. Bake about 35 to 45 minutes or until top is lightly browned and a food thermometer inserted into the lasagna registers 165 degrees F. Let stand 10 minutes before serving. One 10-oz bag of fresh spinach equals approximately 5-6 cups of leaves. If you wish to use frozen spinach, substitute 1 package (10 oz.) frozen chopped spinach, that has been thawed and well drained. Nutrition Facts: Calories, 380; Calories from fat, 150; Total fat, 16g; Saturated fat, 8g; Trans fat 0g; Cholesterol, 85mg; Sodium, 460mg; Total Carbohydrate, 33g; Fiber, 7g; Protein, 27g; Vit. A, 50%; Vit. C, 10%; Calcium, 90%; Iron, 15%. 2. Add remaining ingredients, and mix well. Tip: Use any colorful vegetables you have on hand: carrots, cherry tomatoes, green onions, or frozen peas. Nutrition Facts: Calories, 220; Calories from fat, 24; Total fat, 3g; Saturated fat, 0g; Trans fat 0g; Cholesterol, 0mg; Sodium, 230mg; Total Carbohydrate, 43g; Fiber, 5g; Protein, 8g; Vitamin A, 2%; Vitamin C, 30%; Calcium, 4%; Iron, 10%. 1. Preheat oven to 400 degrees. Lightly oil muffin tins (18 muffins). 2. In a medium bowl, combine flours, baking powder, baking soda, cinnamon, nutmeg and allspice. 3. In a large bowl, mash sweet potatoes. Add brown sugar, eggs, orange juice, carrots and vanilla. Blend well. 4. Add dry ingredients to liquid ingredients and mix well. 5. Fill muffin tins 2/3 full. 6. Bake 15-20 minutes, until tops are brown. Let cool and remove from tins. Nutrition Facts:Calories, 120; Calories from fat, 10; Total fat, 1g; Saturated fat, 0g; Trans fat 0g; Cholesterol, 20mg; Sodium, 220mg; Total Carbohydrate, 27g; Fiber, 2g; Protein, 3 g; Vit. A, 60%; Vit. C, 15%; Calcium, 6%; Iron, 6%. 1. Microwave sweet potatoes until soft; let cool. Peel and mash potatoes, using an electric mixer. Add milk, egg, and vegetable oil to potatoes; mix. 2. Sift together dry ingredients and add to potato mixture. Mix on low until just blended. 3. Heat non-stick skillet or griddle over medium heat; coat skillet with cooking spray. 4. Use ¼ cup of batter per pancake, ladling into hot skillet. Wait until pancake bubbles and looks slightly dry on top before flipping over. 5. While pancakes are cooking, heat 1 tbsp. vegetable oil in another skillet (do not use non-stick) over medium flame. Add quartered mushrooms and toss to coat with oil. Let simmer, stirring occasionally, until juices run. Add maple syrup and balsamic vinegar to pan. Let simmer until sauce reduces and thickens. 6. 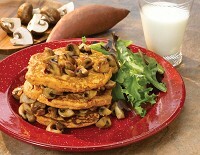 To serve, stack 2-3 pancakes, alternating with balsamic maple mushrooms. Nutrition Facts: Calories, 420; Calories from fat, 110; Total fat, 12g; Saturated fat, 1.5g; Trans fat 0g; Cholesterol, 50mg; Sodium, 480mg; Total Carbohydrate, 70g; Fiber, 7g; Protein, 7g; Vit. A, 390%; Vit. C, 25%; Calcium, 30%; Iron, 15%. 2. Combine flours, sugar, baking powder, baking soda and salt in large bowl; stir with whisk. 3. In separate bowl, combine buttermilk, oil, egg and egg white; stir with whisk. 5. Heat nonstick griddle or nonstick skillet coated with cooking spray over medium heat. 6. Spoon about 1/4 cup batter per pancake onto griddle. Turn pancakes over when tops are covered with bubbles and edges look cooked. 7. Serve with your favorite pancake topping. Remember: butter, syrup and any toppings add calories and possibly fat. Try topping pancakes with fresh fruit for added fiber and flavor for only a few calories.